Unifying, soothing, comforting: Simon and Garfunkel's Bridge over Troubled Water quickly became the album of an era upon release in 1970, the benchmark set serving as a beacon of hope and hymn of reassurance during a time marked by polarizing changes, social unrest, uncertain politics, and the dawn of a new era. These uplifting reasons – to say nothing about the gorgeous songwriting, meticulous production, and watershed performances – attest to why it is more relevant than ever in our current climate. Music, Bridge over Troubled Water simultaneously suggests and proves, heals all wounds and lifts all boats. Music Direct is honored to give the seminal effort Rolling Stone named the 51st Greatest Album of All Time unsurpassed treatment befitting the most important recordings. 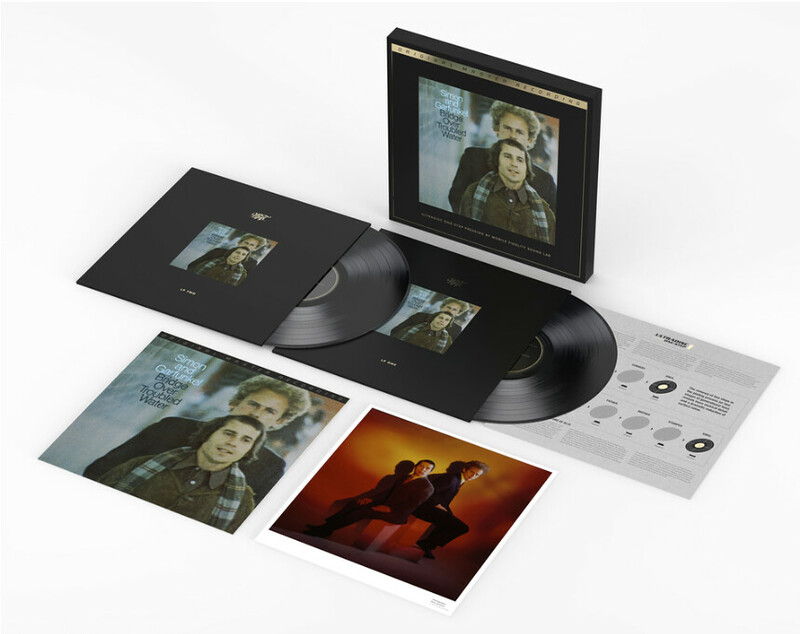 Simon and Garfunkel's epochal album reaches three-dimensional sonic and emotional heights never before attained on Mobile Fidelity's opulent UD1S (UltraDisc One-Step) box set. Strictly limited to 7,500 numbered copies, this ultra-hi-fi collector's edition literally and figuratively brings you closer to music that picks up where the duo's Bookends leaves off. You'll enjoy deep-black backgrounds, boundless soundstaging, pointillist details, staggering dynamics, and arguably, the most lifelike tonalities and nuances ever committed to vinyl. Experienced via UD1S, Bridge over Troubled Water places Simon, Garfunkel, and their cadre of session pros in your listening room. Every note, breath, and movement is reproduced with exquisite accuracy, wowing clarity, and impeccable balance. Consider this edition your new go-to reference. The lavish packaging and beautiful presentation of Mobile Fidelity's Bridge over Troubled Water pressing befit its extremely select status. Housed in a deluxe box, this UD1S version contains a unique print, special foil-stamped jackets, and faithful-to-the-original graphics that illuminate the splendor of the recording. No expense has been spared. Aurally and visually, this reissue of Bridge over Troubled Water exists a curatorial artifact meant to be preserved, poured over, touched, and examined. It is made for discerning listeners that prize sound quality and creativity, and who desire to fully immerse themselves in the art – and everything involved with the album, from the images to the textures and liner notes. The best-selling record in the U.S. for several years running, and winner of six Grammy Awards – including nods for Record of the Year, Album of the Year, Song of the Year, and Best Engineered Recording – Bridge over Troubled Water endures as a staple of accessible sophistication, angelic elegance, effortless singing, unhinged ambition, and therapeutic spirit. 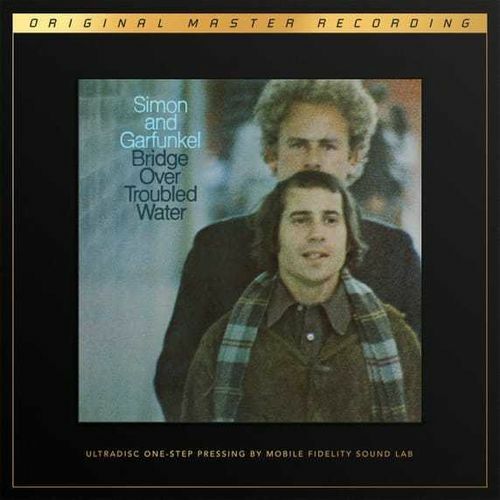 While it would turn out to be the final studio set for a duo surrounded by creative and personal disagreement, Simon and Garfunkel's collaborative ethos and soaring harmonies – combined with reflective narratives centered on the American experience, friendship, romance, and farewells – combine to turn the 11-track work into a paean to resolution, reconciliation, calm, and balance. Home to the legendary title track graced by Garfunkel's pacifying solo lead vocals as well as the equally famous folk ballad "The Boxer," Peruvian-based "El Condor Past (If I Could)," upbeat "Cecilia," and rock n' rolling "Baby Driver" – recently the inspiration behind the film of the same name – Bridge over Troubled Water remains as renowned for its musical diversity as its lyrical poignancy. Moving beyond the templates they'd perfected on four prior albums, Simon and Garfunkel embrace a then-unimaginable swath of styles. Rock, pop, gospel, country, R&B, South American, and jazz strains course throughout the songs, each sparked with bold experiments yet grounded in a well-orchestrated melange of melody, rhythm, and classicism that makes every note feel personal, familiar, and warm. Not for nothing is Bridge over Troubled Water one of the finest-sounding albums ever made. Featuring instrumentation helmed by members of Los Angeles' fabled Wrecking Crew as well as multiple choral and string sections, songs took hundreds of hours to complete and involved pioneering recording techniques. Evoking both Phil Spector's live"Wall of Sound" approach as well as inventive effects, Bridge over Troubled Water is a triumph of texture, atmosphere, and architecture. Mobile Fidelity's premier UD1S edition brings the record's unique traits to the fore. Whether the reverberation generated by Garfunkel's cassette recorder on "Cecilia," echoing drums captured in a corridor heard throughout "The Boxer," automobile noises peppering "Baby Driver," layer upon layer of voices dotting "The Only Boy Living in New York," or echo-chamber percussion on the title track, each and every detail comes through with unprecedented accuracy, clarity, and dimensionality. In every regard, Bridge over Troubled Water exudes genius.